The unlimited ridge tile forming machine is divided into two kinds of machine, including ridge capping forming machine and unlimited ridge tile forming machine. This unlimited ridge tile forming machine specially applies to produce high quality steel ridge capping for steel stepped tile. Despite we have produced this kind of auxiliary equipment for over ten years; our engineers are still improving their skills to the higher standard. 1. This unlimited ridge tile forming machine is a professional machinery to produce the steel ridge capping. 2. The machinery is equipped with programmable logic controller (PLC), so the products are manufactured continuously. 3. The data is directly input by the touch screen due to the man machine interface. 4. The unlimited ridge tile forming machine is also equipped with hydraulic drive, shear and crimping device, which greatly reduce the cost. 5. The clients’ requirements can be customized, too. 6. All the products enjoy 1 year warranty. 1 Thickness of Forming Sheet: 0.4 ~ 0.6 mm (Pre-painted steel). 2 Forming Speed: 4 ~ 6 M/min. 3 Roll Shaft Diameters: 60 mm. 4 Number of Station: 8 ~ 10 sets. 5 Main Motor: 7.5 HP. 6 Complete with mandrel type uncoiler and hydraulic cutting device. 7 Complete with one set of crimping mold. 8 This machine is controlled by computer system with touch screen. 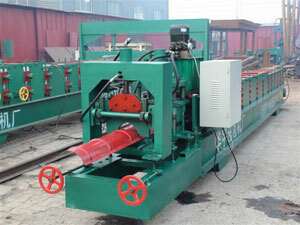 This unlimited ridge tile forming machine can use the unlimited length to press the ridge tile. As a result, some phenomena can be avoided, such as leakage of rain and breakage at the places of seams and joints. This unlimited ridge tile forming machine, having beautiful appearance, is used for not only both large and small projects, but also the rain proofing and waterproofing projects. Yingkou Changsheng Steel Structure Project Co.Ltd is a professional manufacturer and supplier of roll forming machine in China. Apart from auxiliary equipment products, like multifunction window - door taping machine, color coated steel coils, etc. we also offer EPS - rock wool sandwich panel machine like C purlin roll forming machine, Z purlin roll forming machine etc; high pressure polyurethane insulation painting machine including low pressure polyurethane foam machine and high pressure polyurethane foam machine; k-span machine, like automatic building machine, ultimate building machine and arch style buildings forming machine. With good quality and affordable price, the products produced by our company has exported Germany, Holland, India, Indonesia, New Zealand, Syria, United Arab Emirates, Russia, Kuwait, South Africa, and Bangladesh. If you are interested in our products, please contact us for details.